Two guys riding their bikes to make a difference. Starting June 1, 2015, Justin Ahrens and Brian MacDonald will ride 450 miles down the California coast from Santa Rosa to San Luis Obispo so a children’s school in the Democratic Republic of the Congo can receive clean water and sanitation. For each mile they ride, Justin and Brian hope to raise $40 to give a child water and hygiene training for life. In all, the 450 mile ride will help 450 kids! Following their 2014 ride to raise funds for a community in Uganda to receive clean water and sanitation, the 2015 ride will benefit a school in the Democratic Republic of the Congo serving 450 children. These children are facing extreme health concerns daily from the lack of clean water and hygienic training. Justin Ahrens (Rule29) and Brian MacDonald (Wonderkind Studios) are riding from Santa Rosa, CA to the Lifewater headquarters in San Luis Obispo, CA, using one of the most famous and picturesque highways in the United States: the Pacific Coast Highway. During the ride they will share the story of the Congo’s water crisis with all they encounter. This year, Justin and Brian will be joined by Ryan Connary from Timberland, as well as Tony Narducci, President of O’Neil Printing. The crew hopes the 2015 ride will further help Lifewater International to gain awareness and funding to fight preventable, resource-related deaths in vulnerable communities around the world. They believe progress sometimes starts with one pedal after another. 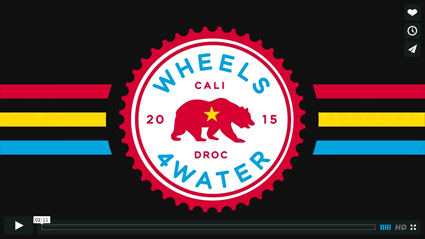 Pactimo is proud to once again support Wheels4Water as their cycling clothing partner. We encourage you to support their great cause by making a donation. You can also lend your support by sharing information about the ride and its goals on social media.